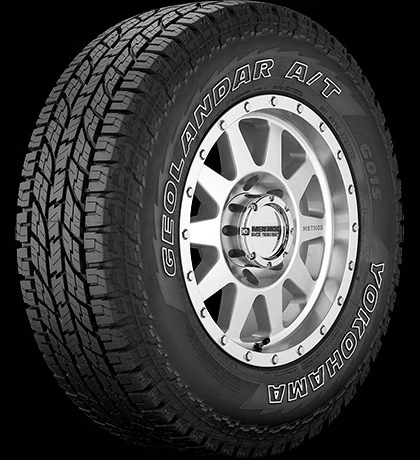 The Geolandar A/T G015 is Yokohama's On-/Off-Road All-Terrain tire developed for drivers of light trucks and SUVs looking for a tough and durable tire capable of withstanding off-road duty while providing long treadlife and year-round traction, even in snow. The tire's internal construction consists of two high-tensile steel belts on top of a two-ply polyester cord casing and a spirally-wrapped nylon reinforcement to blend stability with ride comfort. Note: Yokohama Geolandar A/T G015 tires meet the industry's severe snow service requirements and are branded with the three-peak mountain/snowflake symbol (3PMSF). Note: While non-winter tires featuring the Three-Peak Mountain Snowflake symbol (3PMSF) provide additional longitudinal snow traction beyond what all-season (M+S) tires not bearing the symbol can deliver, they do not match the capability of a true winter tire in all adverse weather conditions.